Some companies love their desktop diagramming software, but the individual licenses are too expensive to allow everyone to have a license. Even though those companies should know how much diagramming can help improve processes and knowledge management in all departments. draw.io can import many diagram formats – Gliffy, VSDX, PNG (with XML), SVG, JPEG, and it can even visualize data in CSV files! 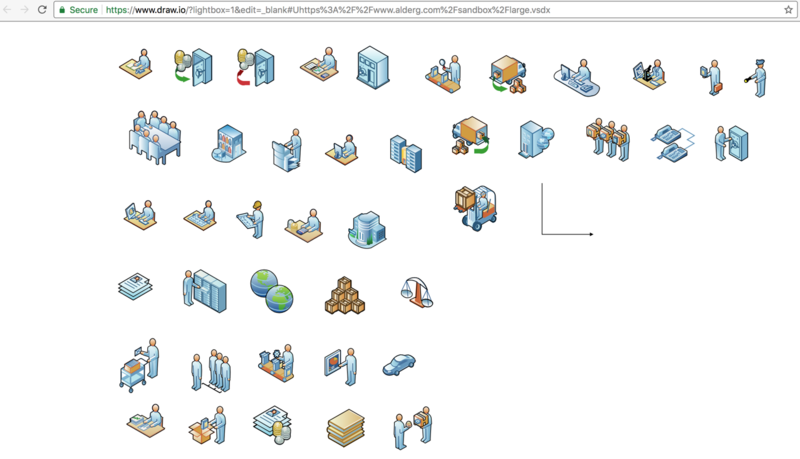 You can let all your employees access the diagrams you create by using draw.io as a viewer. This works for VSDX, Gliffy, Lucidchart and draw.io diagrams. Paste the address (URL) where your diagram file is stored in the Link to Diagram field. Full Screen Mode: displays your diagram in the browser. From here you can print it or save it as a PNG file. This is the default option. Editor: opens a copy of your diagram in the draw.io editor. IFrame: creates code that you can paste into your website or blog to display your diagram. You can set the height of diagram here. When you click on your link, it will open the diagram stored at your URL in draw.io either in view mode or edit mode. You can share this link with your colleagues (or the world!) Now, even if they don’t have the software you created your diagram in, they will be able to view it with draw.io. If you chose the IFrame mode, when you click on Click Here, your code will be displayed below. You can then copy this code and paste it into your webpage or blog post to embed your diagram. Let the world view your diagrams with draw.io! How to create a diagram from data stored in a CSV spreadsheet file – there is also a tool that lets you generate a link to view a CSV file visually!